Rent Artisans Restaurant | Corporate Events | Wedding Locations, Event Spaces and Party Venues. Artisans Cuisine & Savoir-faire offers innovative and eclectic French cuisine, focusing on creative dishes using fresh market e and original combinations of spices and seasonings. Located in the heart of Houston’s Midtown area, we deliver an authentic French dining experience. From the intimate 28-seat Table du Chef, which offers front-row dining, to the mezzanine level tables and more intimate Fleurs-de-Lis banquettes, the elegant ambiance offers a distinctive dining experience for couples, business lunches and events for all occasions. “Le Salon” is the room for our grandest events and seats up to 80. An Innovative moveable wall makes this room smaller, as needed, so that all events feel perfectly sized for the space. Our Director of Group Sales will assist you in determining the right number of round and square tables, ensuring that each guest experiences the ultimate in sophisticated dining. Guests of this room experience first-class service, as it features a separate, dedicated kitchen – set apart from the restaurant’s regular diners. The “Medieval Room I” seats up to 12, The “Medieval Room II” seats up to 10. When combined, the “Medieval Rooms” together will seat up to 24. The two Medieval Rooms at Artisans Restaurant evoke the intimate, hidden charm of a private dining room or inner sanctum of a grand estate. With wood paneled walls and low ceilings, over-sized farmhouse tables and the soft glow of custom chandeliers, this is the perfect setting for intimate groups and special occasions. The padded chairs offer the ultimate in comfort, and the one-way glass window provides an up-close-and-personal view of the kitchen as the Artisans craft your innovative and eclectic cuisine. “La Veranda” seats up to 14. Behind the fleur-de-lis frosted glass panels lies a hidden wine cellar within a sophisticated French restaurant. The newly remodeled “La Veranda” features one full wall of wine bottles displayed in a custom fitted wine rack crafted from premium woods. The stained concrete floors and cavernous ceilings all lend themselves to old-world flavor and ambiance. Planners can choose from one long farmhouse table or 2 smaller 60” rounds. 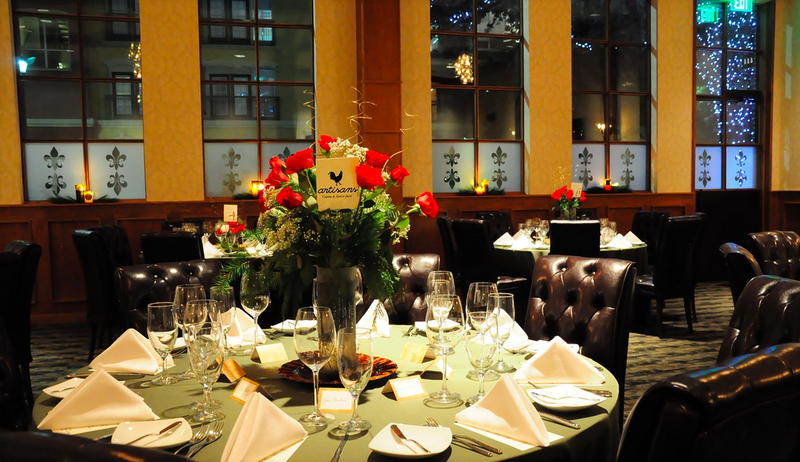 Tufted black leather chairs, attentive service and the finest in French cuisine will ensure your event is a success.